In my book chapters about exploit development, I note that finding bad characters is outside of the scope of the chapters and just give the readers the bad characters list. With only four exploit development chapters in the book, there is just so much I can cover. My editors asked me to provide a resource where readers who are interested can get more information on how to do this themselves as they continue their exploit development education. I cover this in my exploit development class, but I couldn’t find a good resource online. So naturally I just made my own. I’ll use specific vulnerable examples here, but the concepts should be the same regardless of the exploit you are working on. A simple, if a bit tedious, way of checking which characters we can use in our exploit string, is to add this entire string to our exploit after the saved return pointer and compare the results in memory. We want to put the bad characters after the saved return pointer overwrite to ensure that any corruption due to bad characters does not stop the saved return pointer from being overwritten. The examples in this post are saved return pointer overwrites, but placement may also be a factor when working with SEH overwrites. You need not put the bad characters after the SEH overwrite but you do need to take note of what is causing the exception and make sure your bad characters don’t stop it from occurring. For example if your vulnerable software is throwing an exception while reading 41414141 when you are sending a long string of A’s, you need to insure that you avoid putting your bad characters at the offset that is causing that read error or else you may end up reading from a spot in memory that is mapped and readable by the application, avoiding the exception altogether. The Python code below will crash War-FTP 1.65. If you would like to follow along download and unzip the app, open the War-FTP executable, click the lightening bolt to put the FTP server online. Connect to it with Immunity Debugger. My examples in this post are running on Windows XP SP3, but since all we will be doing is crashing the apps and looking for bad characters, another version of Windows will work. Run the exploit over the network to cause a crash in War-FTP as shown below. 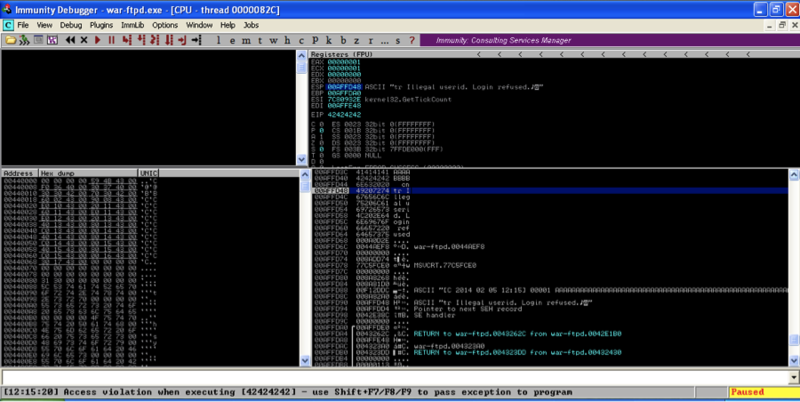 Take a look at the stack in the bottom right pane in Immunity Debugger. Scroll up until you see 42424242. That is the saved return pointer overwrite. Note the strings of A’s (41) after the saved return point overwrite. Take note of the memory address where the A’s start (00AFFD44 in this case). This is where we will put our badchars string. Typically when developing exploits our next step is to overwrite the saved return pointer with a valid memory address that sends us to part of the attack string which we will replace with shellcode to be executed. For this example make sure to continue to overwrite the saved return pointer with an invalid address (such as 42424242) which will cause a crash and allow us to examine memory and compare the bad characters. Now restart War-FTP and add the badchars variable to the attack string right after the 4 B’s for the saved return pointer overwrite. Again we crash the program while trying to execute 42424242, but if we look at the stack, our badchars and the rest of the A’s are nowhere to be found. The first character in badchars is Null, which is commonly a bad character since it terminates strings. No doubt our username variable is processed by War-FTP as a string, and the program considers the Null to be the end of our username. Since we put our badchars variable after the saved return pointer overwrite we were still able to get a crash even though the rest of our attack string disappeared. This illustrates why it’s a good practice to put the bad chars variable after the characters that cause the crash. If we had started our attack string with badchars, we may not have gotten a crash at all. Let’s try this again removing Null from the beginning of the bad chars variable. This time we start to see our badchars string on the stack. After 42424242 we see in little endian order 01 through 09. Where 0A should be we see 20 and everything after that seems to be corrupted as well. 01-09 are good characters that we can use in our attack string but 0A seems to be corrupted. Let’s remove it from our badchars variable and try again. Now with 0A removed, 0B and 0C print properly, but 0D corrupts and terminates the badchars string. Now remove 0D and try again. 220 Please enter your user name. Unfortunately, for this particular app we will need to do a little critical thinking about how FTP login works to find the next bad character. 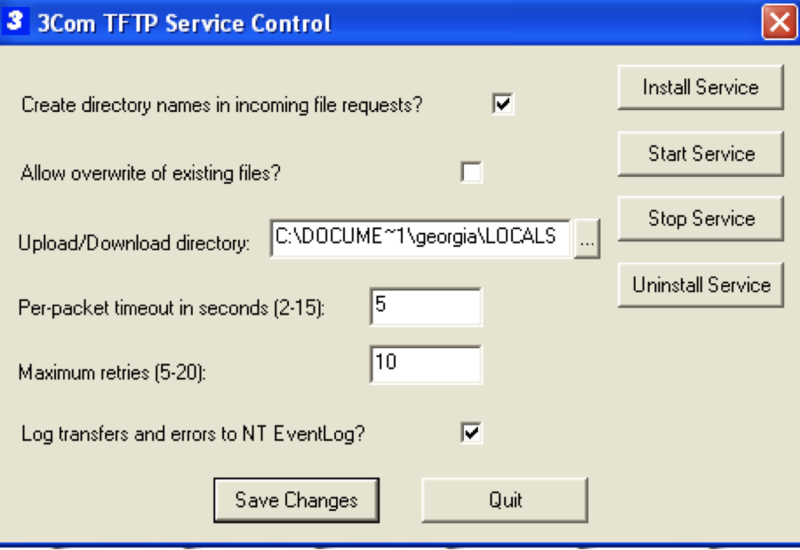 The syntax for FTP logins is username@server, so when I login with the username Georgia it is processed as Georgia@192.168.20.103. So if @(40) is part of the username it will be processed as AAAAAAA…@….AAAAA@192.168.20.103 breaking the FTP spec. Let’s try removing 40 from badchars and see if that fixes the problem. Now we see a much longer badchars string on the stack. It is easy to take a shortcut and just scroll down and see if ff is there and assume that there was no other corruption. 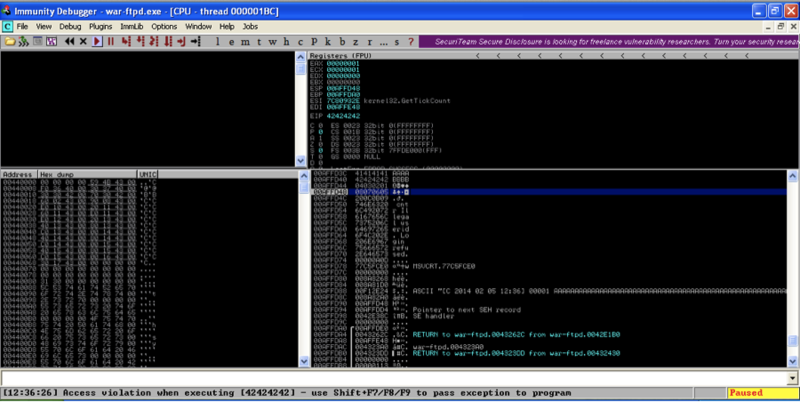 In this case every corrupt byte terminated the badchars string, but that is not always the case. If you continue building exploits you will encounter situations where a single character corrupts but the rest of the badchars string is still printed correctly. Carefully comparing the bytes on the stack one by one to the badchars string is the only way to check that there are no more bad characters. Unfortunately, this is very tedious and it’s easy to make a mistake. The bad characters for War-FTP are hex 00 0a 0d and 40. We had to find 40 with logic, but if we apply logic to 00,0a, and 0d, they make sense as well. Line feed and carriage return denote the end of the line, and the program likely sees that as the end of the username entry. Likewise the null byte denotes the end of a string. 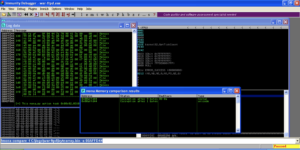 Though there’s no way to use a program for critical thinking, we can use Mona.py to automate the tedious byte by byte comparisons with the Mona.py plugin for Immunity Debugger. Let’s start with the full character array again and use Mona.py to find the bad characters in War-FTP. This tells Mona.py where to log all its output. while attached to the War-FTP process. This will create the entire character array from 00 to FF in .bin format for comparison. Note that the .bin file needs to exactly match the bad character string you add to the exploit. Any changes you make to the string will need to be changed in the .bin file as well for Mona.py to be able to work correctly. Open C:\logs\war-ftpd\bytearray.txt and drop the bytearray into your exploit. This will replace any missing characters we took out in the previous exercise. Now run the updated exploit. Take note of the memory address where the badchars string should begin on the stack : 00AFFD44. Mona.py find 00 as a bad character. 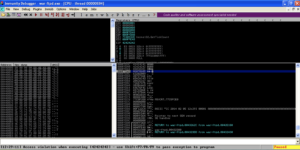 Edit your Python script with the new byte array as well, and run the exploit again. Use Mona.py to compare memory to the new byte array. Mona.py discovers that 0a is also a bad character. More detailed output of !mona compare is included is logged in the file C:\logs\war-ftpd\compare.txt. 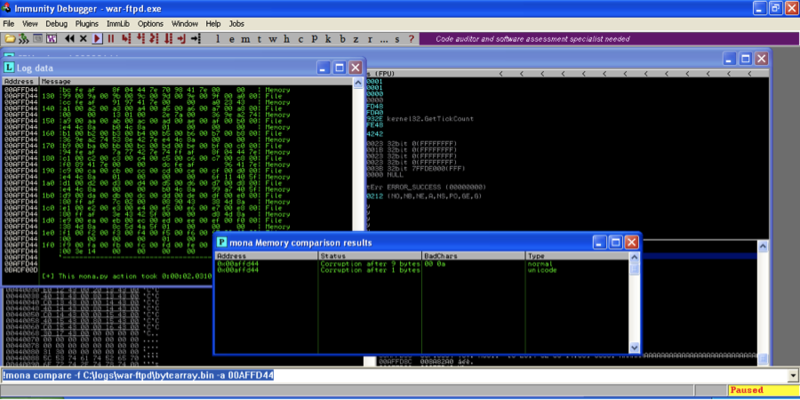 In compare.txt each memory address has a table that contains info about what is in the file and what is in memory, indicating the differences, and a table that summarizes the changes and indicates what are the bad characters found in the current run. In the first “Comparison results” table, if there is a 100% match between what is in the file vs what is in memory, you won’t see anything in the “Memory” row. In the summary table below the “comparison results” table, you can see a summary of the corruptions found, as well as the possibly bad chars and the bytes that were already omitted. Only 11 original bytes of 'normal' code found. 0  0  9   9   | 01 ... 09 | 01 ... 09 | unmodified! 31 31 1   1   | 20        | 20        | unmodified! 45 45 1   1   | 2e        | 2e        | unmodified! Now create the byte array with 00 and 0a as bad characters. Remember the next bad character 40 caused the program to reject the username, so you will need to tell Mona.py to remove the 40 as well when we build the next bytearray with Mona.py. Update the exploit accordingly and run it. Mona.py finds the byte array unmodified at the specified memory location. In the War-FTP example we had plenty of space after the saved return pointer overwrite to put our entire badchar string in the exploit string. Now let’s look at an example where we do not have the necessary 256 characters to work with. In Chapter 19 of my book we fuzz and build a Metasploit module for 3com TFTP 2.0.1. 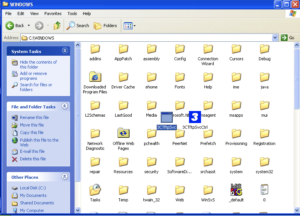 To install 3com TFTP copy 3CTftpSvc and 3comTftpSvcCtrl to C:\WINDOWS. 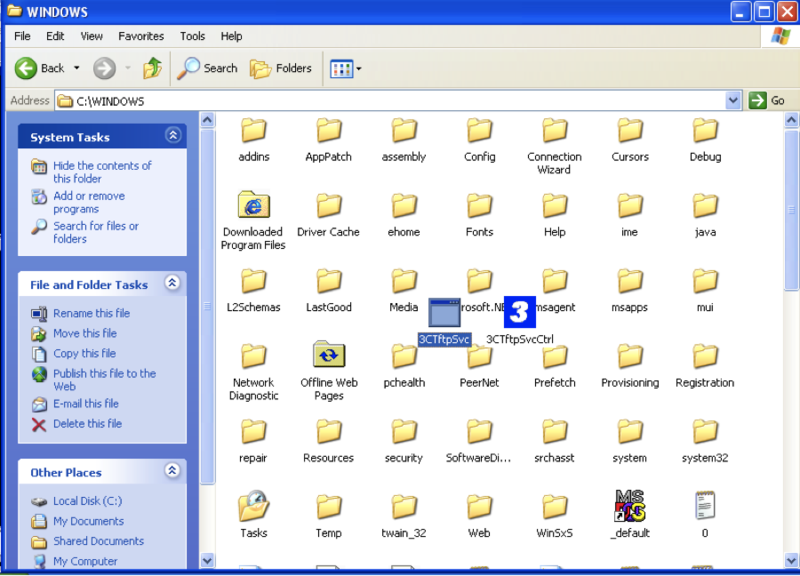 Open 3CTftpSvcCtrl (blue 3 icon) and click Install Service followed by Start Service. You will need to return here to restart the service after a crash. The code below will crash 3com TFTP with BBBB in EIP. packet = "\x00\x02" + "\x41" + "\x00" + buffer + "\x00"
Look at the stack and you will see 23 C’s. We are going to need 256 characters for our bad character string, but if we try to up the C’s at the end just a little to 50, the program doesn’t even crash anymore. Clearly we will not be able to fit the entire 256 characters after the saved return pointer overwrite. will create a byte array of 01 through 1f. Add the byte array to the exploit as in the previous example. You will see that all of the bytes have printed correctly. which will create a byte array of 20 through 3f. And so on and so forth until you have tried the entire character set.